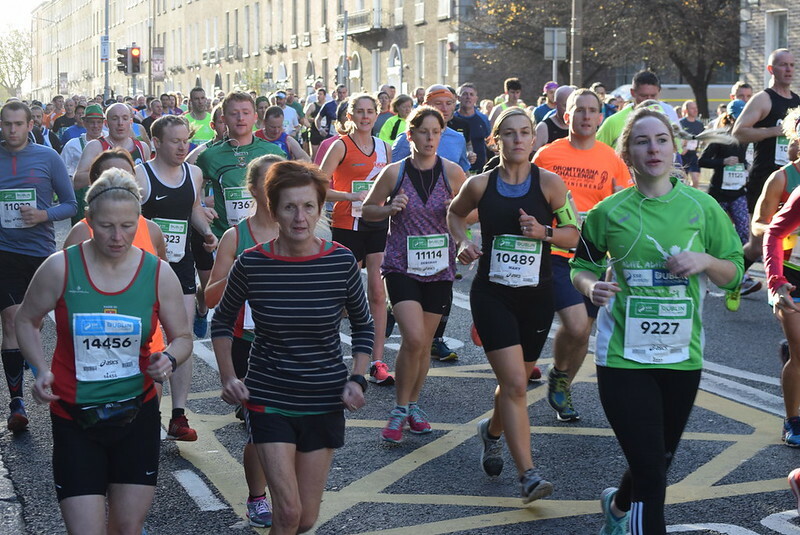 This is a photograph from the SSE Airtricity Dublin City Marathon 2017 which was held in Dublin Ireland on Sunday 29th of October 2017 at 09:00. This year is the second year since the organisers decided to move the marathon from its traditional Bank Holiday Monday slot to Sunday. This proved to be an incredible success with yet again one of the largest field ever for the marathon in Dublin. The weather was absolutely perfect with ideal running conditions for the marathon with just some windy spots around the route. Temperatures were around 10 – 13C. These are COMPLETELY UNOFFICIAL PHOTOGRAPHS – you should check the links below for official media and other materials about the race. Yes – of course you can! Flickr provides several ways to share this and other photographs in this Flickr set. You can share directly to: email, Facebook, Instagram, Pinterest, Twitter, Tumblr, LiveJournal, and WordPress and Blogger blog sites. Your mobile, tablet, or desktop device will also offer you several different options for sharing this photo page on your social media outlets. BUT….. Wait there a minute…. You can download this photographic image here directly to your computer or device. This version is the low resolution web-quality image. How to download will vary slight from device to device and from browser to browser. Have a look for a down-arrow symbol or the link to ‘View/Download’ all sizes. When you click on either of these you will be presented with the option to download the image. Remember just doing a right-click and "save target as" will not work on Flickr. In summary please remember when requesting photographs from us – If you are using the photographs online all we ask is for you to provide a link back to our Flickr set or Flickr pages. You will find the link above clearly outlined in the description text which accompanies this photograph. Taking these photographs and preparing them for online posting takes a significant effort and time. We are not posting photographs to Flickr for commercial reasons. If you really like what we do please spread the link around your social media, send us an email, leave a comment beside the photographs, send us a Flickr email, etc. If you are using the photographs in newspapers or magazines we ask that you mention where the original photograph came from. Attribution– anyone using our photographs gives us an appropriate credit for it. This ensures that people aren’t taking our photographs and passing them off as their own. This usually just mean putting a link to our photographs somewhere on your website, blog, or Facebook where other people can see it. I ran in the race – but my photograph doesn’t appear here in your Flickr set! What gives? ►We simply missed you – sorry about that – we did our best! You can email us petermooney78 AT gmail DOT com to enquire if we have a photograph of you which didn’t make the final Flickr selection for the race. But we cannot promise that there will be photograph there. As alternatives we advise you to contact the race organisers to enquire if there were (1) other photographs taking photographs at the race event or if (2) there were professional commercial sports photographers taking photographs which might have some photographs of you available for purchase. You might find some links for further information above. Don’t like your photograph here? Image published by Peter Mooney on 2017-10-29 15:53:10 and used under Creative Commons license.